It's out later this year. 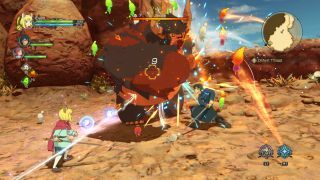 Ni No Kuni 2—sequel to the gorgeous PS3 and DS RPG that looked like an interactive Studio Ghibli film, and that played like My First JRPG—is coming to PC, and more of the genre on the keyboardy platform is always good news. In fact, after watching the recent trailer, I think I'd upgrade that to great news, as Ni No Kuni 2 appears much improved over its predecessor. The animation is even better, battles look more engaging, and you even get a load of Pikmin-ish things to order about in combat. Speaking of combat, you can see the heroes of this epic fantasy adventure bash an angry troll thing about in the video below. Battle aside, you also get a brief glimpse of exploration, and a bigger glimpse of the game's overworld, which reminds me just how much I love overworlds in JRPGs. Thankfully there are no random battles in this one; barnies only kick off after your party makes contact with an enemy, so you'll be able to explore without getting constantly interrupted. Anyhoo, Ni No Kuni 2 is coming to PC on the same day it arrives for PS4. We don't have that date yet, but it'll be sometime later this year.